Welcome to another interview for the Platforms & Purpose series. 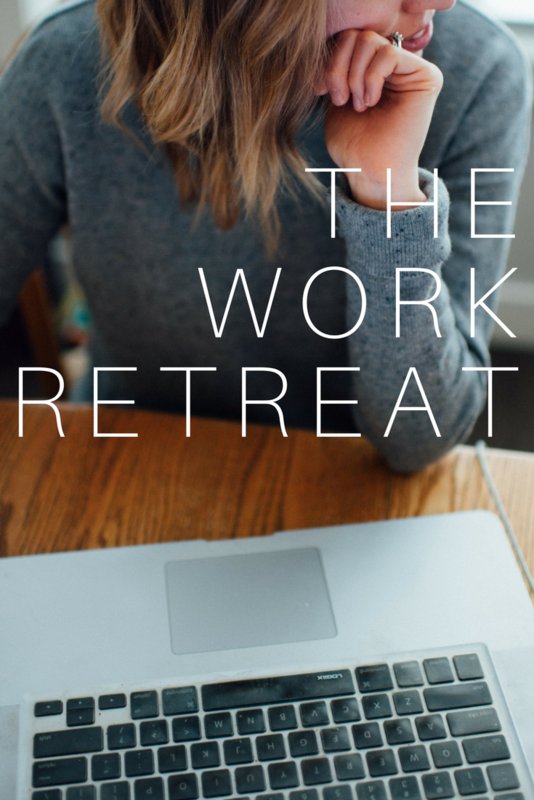 In this series we have Canadian women giving us a generous view of how they approach their online life through the lens of faith, community building and translating it into offline life. 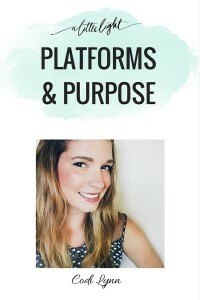 If you haven’t heard of Codi Lynn, she blogs at Creative Wife & Joyful Worker – a life and style blog for the modern mother. She is a BC mama of two and is currently going to school for graphic design. One look at her site or Instagram feed and her eye for design is evident. We took notice of Codi Lynn on Instagram and were struck with how she incorporates faith, community and the beauty of everyday into her online work. 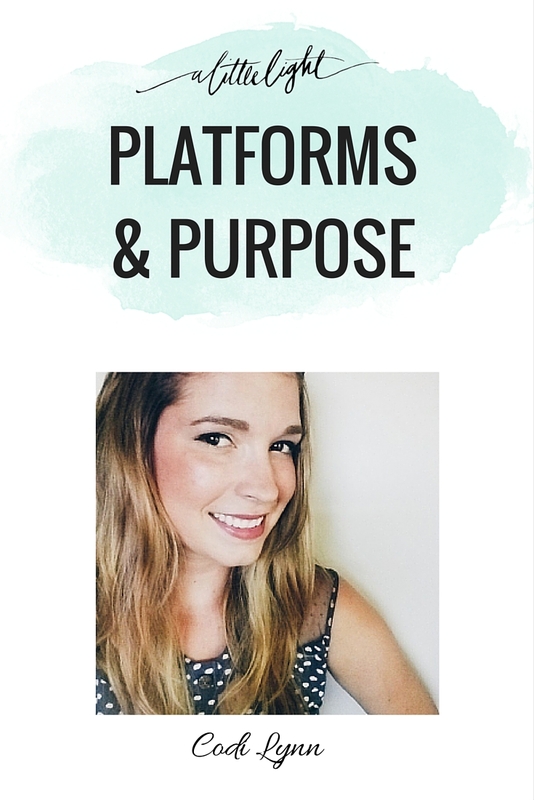 Way back in August Codi Lynn answered our interview questions for the Platforms & Purpose Series. We are excited to share that interview with you today. You are fairly new to blogging, your site is just over a year old, but you seem to have had great success in getting your name out there. What has helped you in your blogging success this past year? The first thing that comes to my head is friendships. My blog would be no where comparable to the state it is today if it wasn’t for the people who I have met along the way and my family and friends that have supported me since the beginning. It is a BIG deal to put things that you love and your own ideas out there to the world and having people who love me encourage me throughout the whole process has been a major help to keep me going strong. Looking more closely at the friendships that I have made, a lot of them have been with small business owners and other bloggers. Making these connections and teaming up with different collaborations is a great way to get both of our names out there. You learn from each other, finding new ways to grow, expand and inspire. Blogging is not something that you can do on your own. When I first started a sent some emails out to some blogs that I liked asking for pointers on favourite hosting sites, tips for starting, and basically any feedback someone would give me… and I was rather discouraged by the lack of response. I made a promise to myself that IF my blog were to become a success that I would be there to give feedback to the people reaching out for support. It is important to encourage each other and I think that it only grows your own brand stronger when you do. You are a mom, wife, going to school and blogging. How do you rely on God to guide you day-to-day? I pray often, in the morning, driving, showering and at night.. Basically, whenever I have a little bit of alone time with myself I say short little prayers that help me feel connected and ease the stress of the day. I have tried to set up specific times of day where I can do a devotional and read my bible, but it hasn’t turned out to be that manageable with the kids. Each day looks completely different from the other, especially with no school, but I would love to pick up a family devotional to start implementing at breakfast time. My mom used to do this with my sisters and I before school in the mornings and I found it a great way to start the morning, fresh and focused on his word. You are taking on blogging and graphic design as a new ‘career’. What did you do before this and what fears or doubts did you have in shifting directions? When I decided to go to school I was on maternity leave with my daughter, I was working as a Customer Service Representative at a small Credit Union. The Credit Union is based on building strong relationships with our members and getting to know them personally. Before that I was working as a Server and Marketing Rep, I served for almost seven years while going to school part-time for Business Administration. When I met my husband I decided to take a break from school as I wasn’t sure which direction I wanted to go career-wise. I got my job at the Credit Union just before we got married and I still work there part-time. Blogging started as a way for me to become more familiar with the online world and the thought about networking and making connections with other small business owners was such a dream. I had no idea what it would turn into and basically just thought it would be a good idea for me to start that platform for when I completed my schooling. I chose to take graphic design as I have always had a love for computers, design and creating beautiful things. I was worried that I wouldn’t be very good at it or that because of the money that we are putting into me going to school that I wouldn’t find a job afterwards. Although, I wouldn’t really call those fears or even doubts anymore, simply just thoughts that I have had pass through my mind. I just need to remind myself that I felt lead to go back to school and complete something that intrigued me, because of that I know that those doubts and fear do not last long. Your site features many products, services and businesses that you love. What can bloggers do to feature business and brands without feeling ‘salesy’? When I first started out a lot of my posts involved small businesses that I loved. I wasn’t talking about any specific product that these businesses sold, but more so sharing about their business strategy. I wanted to know about the things they did to succeed from the beginning, where they were headed, and any tips they could provide for someone starting out. I think that when bloggers focus on posts about features it can become more of a sales pitch as you list of the features and benefits of the product. It is when the post is more personal, you start to learn something about the maker and the writer and it becomes more unique. With the opening of your shop in addition to your blog, what kinds of online apps/tools are you loving? VSCO Cam: I use this app to edit the photos that I take on my phone. Mostly just to crop, straighten and lighten. Sometimes I will apply a filter as well, I have downloaded a couple of filters that I use quite often that brighten the colours that aren’t picked up from the phone camera lens. I like the look of bright well-lit photos, so often just increasing the exposure a hair does the trick alone. As a lifestyle blogger, how do you feel you can incorporate your faith into your posts? Most of my posts are collaborations with other individuals and I don’t often write that much about myself personally – so speaking literally about God often does not appear in my blog posts. I also didn’t want to turn off non-believers from reading my page as I wanted my site to be a place for people to be encouraged and uplifted, with the ability to learn about God’s love through my actions and kind words. Living and sharing a life of love through reflecting God’s character is the biggest way that I incorporate my faith in my posts. I also follow a lot of woman who believe in God so often comments on my social media pages will have reference to scriptures and praying. You have built up a great Instagram following. What tips do you have to others hoping to increase their IG following? I would say don’t look at the numbers. I know that doesn’t make sense… because everyone bases your success on your “following” but I don’t think that is a productive way to look at it. Continually focus on why you started, portray content that reflects that. But you also have to remember, don’t be shy. If you want people to find you, you are going to have to go find them. Instagram is a very time sensitive app, your posts are only active for a max 24 hours (with the first 1-2 hours being the most engaging), so your posts are always going to be how you get noticed. If you are looking to grow and build friendships, don’t wait for them to come to you, go out there browse around and start interacting with people of the same interests. You have started #meetmomsmonday on Instagram where IGers can introduce themselves or another mom they admire. I love that building community is important to you. How has online community changed your life? I started #meetmomsmonday very recently, encouraging others to join in and share. I currently am the only one who has used that tag, but to be honest that doesn’t bother me one bit. Yes, I would love for people to join in and interact with me through this tag, but everything takes time, it may catch on and it may not. I knew that I wanted to start incorporating a way on my feed to introduce some of the inspiring people I follow, so I am quite pleased either way. Building this community is so important to me as my blog is based on encouraging and learning from one and other. I have been much more encouraged as a mother through the community that I have connected myself with and I couldn’t be more thankful for that. #meetmomsmonday is a way for me to give back to those that have inspired me and showed continued support. Your site features small businesses, some you have noted to have ‘met’ through Instagram. What tips do you have for bloggers to build authentic relationships with brands. The most important thing is to be yourself, people are going to be immediately attracted to that. I have been very fortunate to meet many very talented women that run small businesses close to where I live. I feel blessed that I live where I do and that there are so many local business owners that have become so successful. Making the relationships with these ladies came pretty naturally, when you are encouraging each other and helping each other grow it is inevitable that you are going to form some sort of a bond. The first person that I became friends through my blog was Jessica from Mint and Birch. We have had the pleasure of meeting in person a couple of times as we live only about half an hour from each other, and her relationship was really a game changer for me as a blogger. We frequently email each other, about literally anything and everything, sometimes short and sweet and sometimes long rants. We have gone through a lot of the same changes together and that has been a great way for our friendship to grow. It is also super helpful as she can ask me questions from a bloggers perspective and I can ask her things from a shop perspective. When I started my blog I browsed social media looking for people in the same situation as me. Those are the people who you have something to connect with and you can learn together. As you both grow together your relationship naturally builds authentically. The more social you are online the more relationships you are going to build. Commenting on someone’s post is an easy way to start. So long as you are writing something that is true to you and that reveals something about yourself. Relationships take time, but building these connections and learning from one an other makes all the difference in the long run. Many women in social media know the value of a ‘tribe’. How did you find yours and what suggestions would you have to someone looking for ‘tribemates’? This question made me giggle. I remember starting my blog and thinking… oh if only this person followed me… or if only I could feature their product… etc etc the thoughts could have gone on and on. I guess my answer to my last question would be similar to how you would find yout “tribemates”, by being yourself and connecting with other individuals in the same stage that you are at. I haven’t really considered myself to have a “tribe” … I have a group of ladies whose pages I frequent and I know they frequent mine, however I also am open to anyone connecting and becoming a part of my tribe. Some of the people who I have gotten to know better or whose relationships that maybe grew faster were ladies that put in the effort, shared personal stories and continue to show interest in my work. A Little Light is a community of Canadian Christian women who want to explore ways they can use their online platforms with purpose, and their offline platforms for God’s glory. Find out more about the community here.